Kids Yoga & Yoga Teacher Training! Today, about a month shy of two and a half, Landri took her first yoga class. It was a great experience, although it didn’t go quite as well as I had imagined, LOL, and we had to step out a little early! I’m wondering how much of that is due to the fact that she had no nap today and spent the entire afternoon running around in the sunshine at the ranch (i.e. was a bit worn out and unrested, and for those of you familiar with two year olds, skipping nap time doesn’t always lead to the prettiest of outcomes). 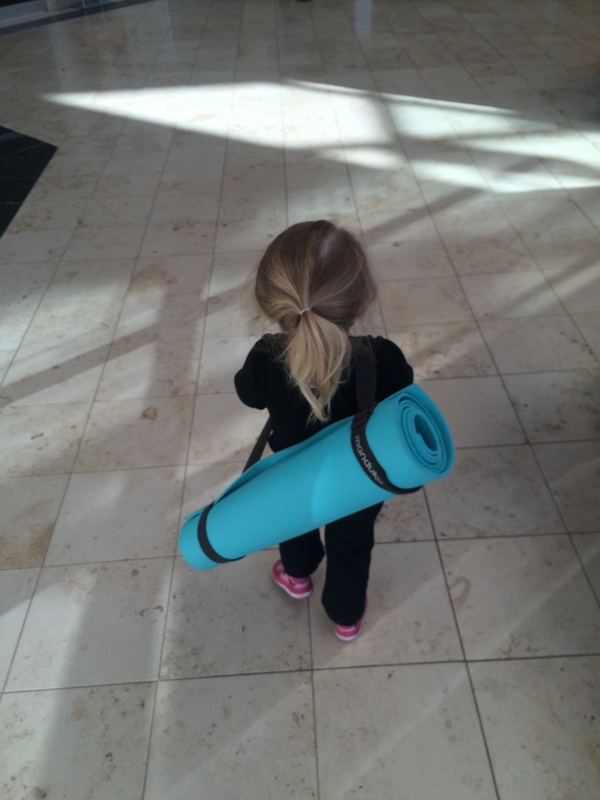 So I take a bit of the blame there – not a smart Mommy move at all… I will say that she talked about attending yoga for days leading up to class and was pretty excited to get to go with Mommy without Baby Rex (“only Mommy and Landri” she kept repeating)! She also LOVED carrying around her yoga mat. Hilarious! I have to admit, she was pretty darn cute (see pics below). She did have fun though; she liked doing frog jumps and making animal sounds (and of course enjoyed some nose picking as well – no, not a part of the class). We will give it another shot – and next time, we will make sure to have a long, luxurious nap prior to class! And speaking of yoga, I am so very excited that I have finally signed up for Yoga Teacher Training – something that I have been wanting to do for years and years. Having class during my entire third trimester of my third pregnancy isn’t totally ideal, but I knew that if I didn’t do it now, it would be another decade or so until I could find the opportunity to do it again. A HUGE shout out to my mom and Scott’s parents who are helping me out with the kids so that this is possible. I would not be able to do this without them. I cannot wait! I’ve started some of the reading and I’ve already had my mind blown several times! I cannot imagine how enlightening this amazing journey will be for me. I look forward to evolving as a human, as a mother, wife, friend, daughter… and while doing it during the end of a pregnancy will have its challenges, what wonderful timing it will be to learn tools to help me embrace the chaos that is likely to ensue with three kids under three! I will share my experience with you guys for those of yall who are interested. Namaste! Previous Post Random: Baby Brain, Daddy Daycare Alert & More!